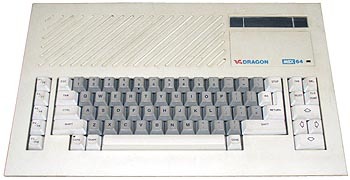 The Dragon MSX computer was announced in mid 85, one year after EuroHard S.A. bought the Dragon Data Company. It was made by Radofin, an Hong Kong company which also designed the Mattel Aquarius computers. It was a standard MSX-1 computer. Although Radofin delivered about 500 pieces, the MSX-64 never reached the dealer shelves because of Eurohard bankruptcy rumors. All of the MSX-64 production, as well as other Dragon prototypes were later given to Eurohard employees as a part of their wage. Image from the Tromax Ancient Computer Museum, proud owner of the MSX-64 Number 37.
see more Dragon Data Ltd MSX-64 Ebay auctions !